Picture this. You're going on a relaxing summer vacation to get away from work and enjoy the peace and quiet, when suddenly a baby starts crying in the hotel room next to yours. And you can hear it all night. Not very relaxing, is it? You might not be super into vacation rental accommodations, but there's a first time for everything! And you might like it more than you think. Here are just a few reasons why vacation condos are better than hotels. While there might be some great hotel deals out there, beachfront condos for rent can often be less expensive. Whether it's just you or it's you and a few friends, fronting the cost of a week in a vacation rental is likely going to be much less than it would be for a hotel. Not to mention you'll likely be closer to sand, sea, and fun in the sun. Whether personal space is extremely important to you or not, four or five people cramped inside a single hotel room is bound to get to you sooner or later. But if you invest in vacation rental accommodations, you'll likely have an entire house and two to three bedrooms for everyone. If you play your cards right, you may even be able to grab a larger home to fit everyone in their own bedroom. 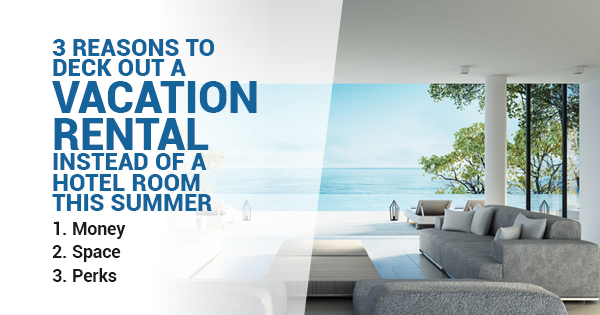 The versatility with space is something that hotel rooms simply can't offer up for you. There are several perks that come exclusively with vacation rentals. Many hosts are located nearby and will welcome you when you begin your stay. They'll likely share some great local knowledge with you like where to eat, when the best beach times are, and some of the best activities. In addition, amenities like a stocked kitchen and bikes or beach supplies are often included in your total rental costs. There might not be any traffic lights on Sanibel Island, but there certainly are vacation rentals available. Whether you're planning a weekend of quiet relaxation or a vacation filled with adventure, there's no doubt that rentals will have everything you need.